The Oaks Globe Paper Lamp Shade has a diameter of 12". The Oaks Globe Paper Lamp Shade has a diameter of 14". The Oaks Globe Paper Lamp Shade has a diameter of 16". The Oaks Globe Paper Lamp Shade has a diameter of 18". The Oaks Globe Paper Lamp Shade has a diameter of 20". The Oaks Abeba Large Lamp Shade Is In An Antique Brass Finish With Acrylic Flowers. The Oaks Abeba Lamp ShadenIs In A Chrome Finish With Acrylic Flowers. The Oaks Abeba Lamp Shade Is In A Polished Brass Finish With Acrylic Flowers. The Oaks 103/3 Acrylic 2 Tier Flush Ceiling Light Is In A Chrome Finish And Is Dressed With Acrylic Prisms Suspended Over 2 Tiers. The Oaks 103 NE Acrylic 2 Tier Lamp Shade Is In A Chrome Finish With Acrylic Prisms Suspended Over Two Tiers. The Oaks Lighting 229 NE Acrylic Lamp Shade Is Dressed With Acrylic Prisms. The Oaks Lighting 807 NE Acrylic Lamp Shade Is Dressed With Acrylic Prisms. 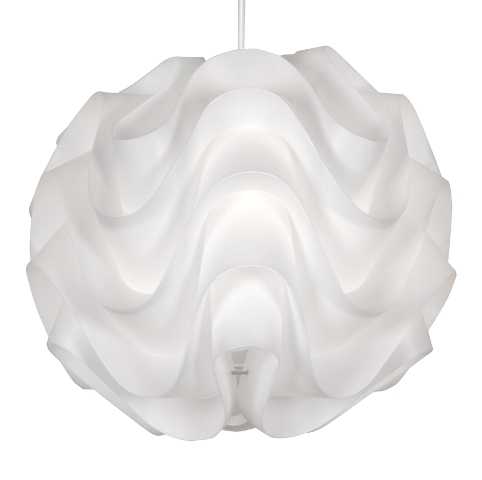 The Oaks Akari Large White Lamp Shade Is An Unusual Wave Design Plastic Lamp Shade. The Oaks Akari Small White Lamp Shade Is An Unusual Wave Design Plastic Lamp Shade. The Oaks Aztec Tiffany Lamp Shade is in vibrant colours and a bold design. The Oaks 14" Cotton Drum Lamp Shade is in Beige. The Oaks 14" Cotton Coolie Lamp Shade is in Black. The Oaks 14" Cotton Drum Lamp Shade is in Black. The Oaks 14" Cotton Drum Lamp Shade is in Blue. The Oaks Tiffany Lamp Shade is decorated with pretty blue butterlies. The Oaks Tiffany Uplighter Lamp Shade is decorated with pretty blue butterlies. The Oaks Braga Lamp Shade is in an Antique Brass finish with acrylic beads. The Oaks Brompton Lamp Shade is in an Antique Copper finish. The Oaks Brompton Lamp Shade is in a Cream Gold finish. The Oaks 12" Brown Drum Lamp Shade has a daisy design. The Oaks 14" Brown Drum Lamp Shade has a daisy design. The Oaks Cadini Lamp Shade is in a Chrome finish with acrylic insets. The Oaks Camillo Tffany Lamp Shade is in a square design with red flowers. The Oaks 14" Cotton Coolie Lamp Shade is in Chocolate. The Oaks 14" Cotton Drum Lamp Shade is in Chocolate Brown. The Oaks 14" Cotton Coolie Lamp Shade is in Cream. The Oaks 14" Cotton Drum Lamp Shade is in Cream. 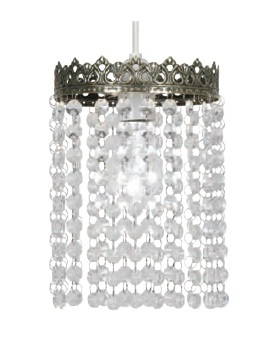 The Firstlight Crown 8633CH Ceiling Lamp Shade is in clear acrylic. The Oaks Crown Tiffany Lamp Shade has a stylised lily design. 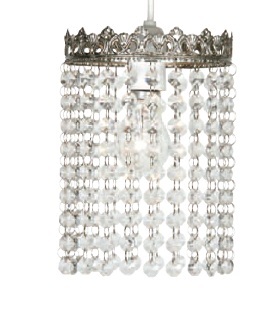 The Firstlight 8112CH crystal lamp shade is in a chrome finish. The Oaks Dacia Large Lamp Shade is in an Antique Brass finish with acrylic drops. The Oaks Dacia Large Lamp Shade is in a Polished Chrome finish with acrylic drops. The Oaks Dacia Large Lamp Shade is in a Polished Brass finish with acrylic drops. The Oaks Dacia Small Lamp Shade is in an Antique Brass finish with acrylic drops. The Oaks Dacia Small Lamp Shade is in a Polished Chrome finish with acrylic drops. The Oaks Dacia Small Lamp Shade is in a Polished Brass finish with acrylic drops. The Oaks Dane Lamp Shade has a Chrome finish frame with acrylic drops. The Oaks Dara Lamp Shade is in an Antique Brass finish with acrylic drops. The Oaks Dara Lamp Shade is in a Polished Chrome finish with acrylic drops. The Oaks Dara Lamp Shade is in a Polished Brass finish with acrylic drops. The Oaks Dragonfly 4 Panel Tiffany Lamp Shade features Amber dragonflies and diamonds. The Oaks Dragonfly 4 Panel Tiffany Lamp Shade features Blue dragonflies and diamonds. The Oaks Dragonfly 4 Panel Tiffany Lamp Shade features Red dragonflies and diamonds. The Oaks 14" Cotton Coolie Lamp Shade is in Duck Egg. The Oaks 14" Cotton Drum Lamp Shade is in Duck Egg. The Oaks Ekon 2 Tier Lamp Shade is in an Antique Brass finish with clear glass drops. The Oaks Ekon 2 Tier Lamp Shade is in a Satin Nickel finish with clear glass drops. The Oaks Ekon Bowl Lamp Shade is in an Antique Brass finish with clear glass drops. The Oaks Ekon Bowl Lamp Shade is in a Satin Nickel finish with clear glass drops. The Oaks Ekon Bowl Lamp Shade is in an Antique Brass finish with clear glass drops and bottom detail. The Oaks Ekon Crown Lamp Shade is in an Antique Brass finish with clear glass drops. The Oaks Ekon Crown Lamp Shade is in a Satin Nickel finish with clear glass drops. The Oaks Ekon 3 Tier Large Lamp Shade is in an Antique Brass finish with coloured glass drops. The Oaks Ekon 3 Tier Small Lamp Shade is in an Antique Brass finish with coloured glass drops. The Oaks Elgg Lamp Shade has a Copper inner shade with a copper outer cage. The Oaks Elgg Lamp Shade has a glass inner shade with a copper outer cage. The Firstlight Emily Ceiling Lampshade is a ribbed Cream fabric shade with co-ordinating diffuser. The Oaks Faro Glass Lamp Shade Is In Red. The Oaks Fleur Lamp Shade is dressed with pretty flowers and butterflies. The Oaks 14" Cotton Drum Lamp Shade is in Forest. The Oaks Garden Tiffany Lamp Shade has 4 leaded glass panels with a stylised floral design. The Oaks Genoa Lamp Shade is a black acrylic shade with contrasting acrylic drops. The Oaks 12" Green Drum Lamp Shade has a black chrysanthemum pattern. The Oaks 14" Cotton Drum Lamp Shade is in Green. The Oaks Green Butterfly Tiffany Lamp Shade has four glass panels. The Oaks Butterfly Tiffany Uplighter Lamp Shade is decorated with pretty green butterflies. The Oaks 14" Cotton Drum Lamp Shade is in Hot Pink. The Oaks 14" Pinched Pleat Faux Silk Lamp Shade is in Ivory. The Oaks Jewel Tiffany Lamp Shade has an Amber leaded glass shade with Clear glass buttons. The Oaks Kendal Round Lamp Shade is in a Chrome finish with acrylic inset beads. The Oaks Kendal Domed Lamp Shade is in a Chrome finish with acrylic inset beads. The Oaks Kendal Cone Lamp Shade is in a Chrome finish with acrylic inset beads. The Oaks Kupe Lamp Shade is a cylindrical metallic lampshade with a floral pattern. The Oaks Leaf Tffany Lamp Shade has a Cream glass shade decorated with Green leaves, Red berries and delicate scrolls. The Oaks 14" Cotton Coolie Lamp Shade is in Light Blue. The Oaks 14" Cotton Drum Lamp Shade is in Light Blue. The Oaks 14" Cotton Drum Lamp Shade is in Lilac. The Oaks Lokura Ceiling Lamp Shade is in a Pink finish. The Oaks Lokura Ceiling Lamp Shade is in a Plum finish. The Oaks Lokura Ceiling Lamp Shade is in a White finish. The Oaks Maia Ceiling Lampshade has Amber and Clear prisms suspended from a Chrome frame. The Oaks Maia Ceiling Lampshade has Blue and Green prisms suspended from a Chrome frame. The Oaks Maia Ceiling Lampshade has Ruby and Pink prisms suspended from a Chrome frame. The Oaks Maia Ceiling Lampshade has Smoked and Clear prisms suspended from a Chrome frame. The Oaks Marley Lamp Shade is in an Antique Copper finish. The Oaks Marley Lamp Shade is in a Chrome finish. The Oaks Marley Lamp Shade is in an Ivory finish. The Oaks Mesh 314 Lamp Shade is in an open fretwork chrome finish mesh over two tiers. The Oaks Mesh 326 Lamp Shade is in an open fretwork chrome finish mesh. We offer a large range of ceiling lamp shades, non-electric pendants to suit all styles and budgets. These easy fit ceiling lamp shades come in many designs, sizes and colours suit all tastes. So if you are looking for a plain fabric or crystal lamp shade for you home we have one to suit.